The three tenets of a Lenten Journey are fasting, prayer, and almsgiving. 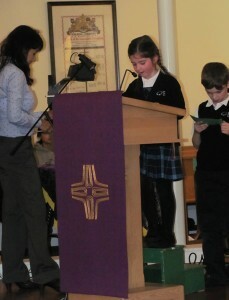 The community at ICS shared a special prayer experience this Lenten season as a part of our journey. It all began on Ash Wednesday when we met in groupings of children from each grade led by a Grade Seven student; these groupings became our “family” during Lent. 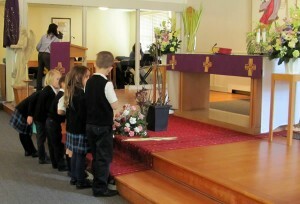 Each of us made a Lenten Promise and a banner signifying the Resurrection of Christ. We then shared in a most beautiful experience by singing the Celtic Alleluia (Alleluia means “Praise God”) which faded into prayerful silence as we left the gym. After Ash Wednesday we continued to meet weekly in the church in our family groups to share in Lenten prayer, led by a different primary grade each week. 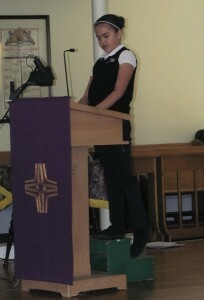 We concluded Lent with a school-wide retreat on Holy Thursday themed “Our Journey From Triduum to Easter”. 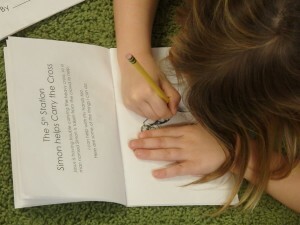 For the students, it was a beautiful, prayer-filled morning of reflection on each Station of the Cross. We thank the parents who shared in our Lenten Journey, which focused on parents as educators using the example of the soon-to-be canonized parents of St. Therese of Lisieux. Maureen Wicken led a reflection on how we embrace and encourage our children to dream and imagine a better world and how God calls them to be in this world.